The Model DXS-72 Supervised Photoelectric Smoke Detector Transmitter is a photoelectric smoke alarm with a built-in transmitter designed for use with Linear’s DXS and DX Format receivers. 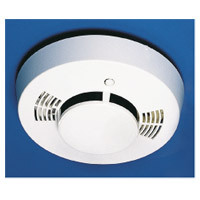 When smoke is detected, the alarm sounds a loud local alarm. Twenty seconds after the local alarm sounds, the built-in transmitter sends a digitally coded wireless signal to its companion receiver. The wireless signal will be repeated every 20 seconds as long as smoke is still present. The digital DXS code format features over a million possible codes. The DXS transmitters are precoded at the factory to unique codes, so no field coding is required. The DXS-72 can send three different codes: alarm, test and low battery status. The unit is powered by two 9-volt alkaline or lithium batteries. These batteries are supplied with the transmitter and can power the unit for up to two years. Every hour, the DXS-72 will send a status transmission to the receiver. The hourly signal updates the receiver to the transmitter’s condition. By monitoring status transmissions, the receiver can determine if a transmitter has a low battery or has been removed from the system. If the battery voltage drops below a preset level the alarm will sound low battery beeps and a low battery signal will be sent to the receiver with status reports (some receivers can report low battery status, others cannot).